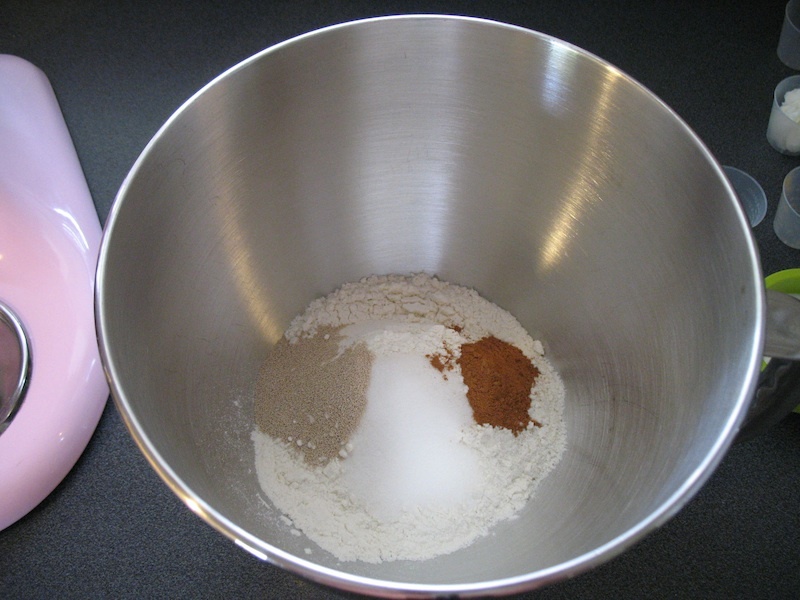 With this ninth recipe in the The Bread Baker’s Apprentice Challenge, we’re making what is generally a “treat” style bread, or at least it was when I was growing up. 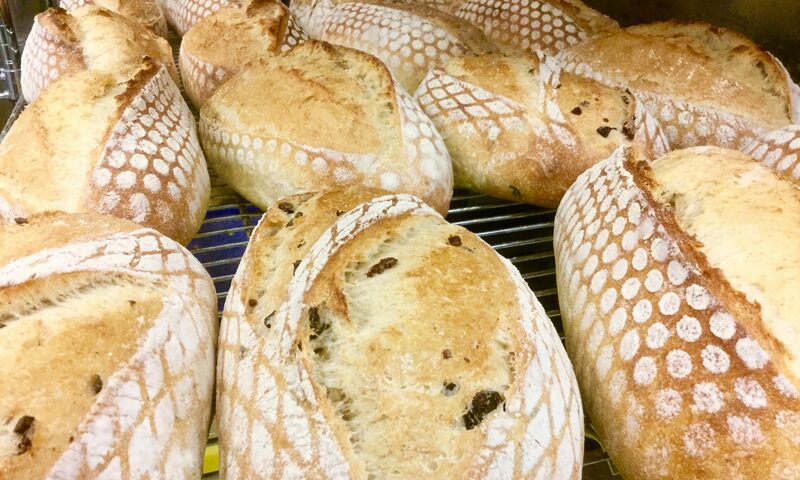 Only very, very occasionally would we be lucky enough to see a loaf of raisin bread show up in the weekly groceries. Having now made this loaf, I can’t tell you how simple it is to make and that there’s really no reason to not treat yourself a little more regularly. 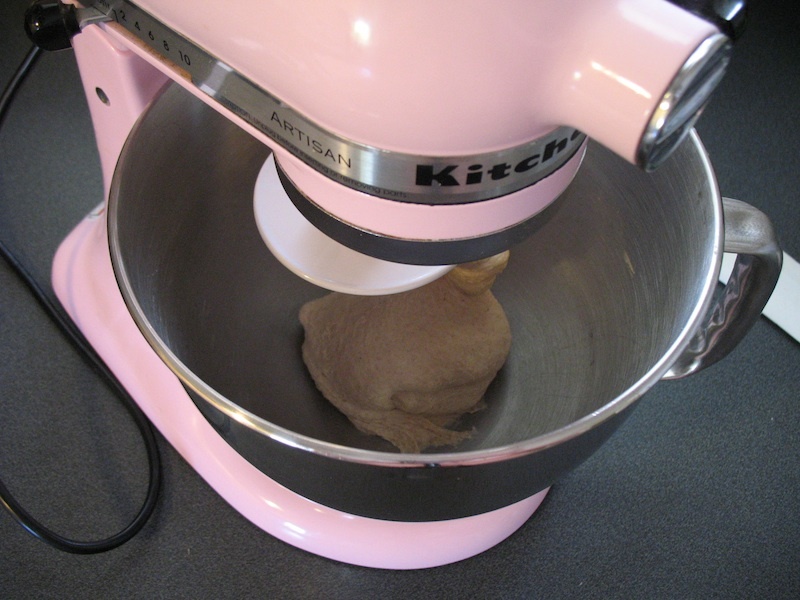 All it is really is mixing the ingredients, knead, rise, shape and pop into the oven. Ridiculously simple. I decided to make just one loaf as I wasn’t really sure if we could get through two loaves before our next challenge bread comes up (corn bread). Well, duh! Why in the world did I think that? It’s half gone already. And it’s barely a few hours old. OK, so get the book and make this!! Impress your friends, treat your family or yourself. It’s super simple and one hella lot cheaper than buying the same thing at the store (not counting on the fact it’s just not as good as home made)! First, we measure it all out. Again, I’ll point out I made a half recipe so you’d have double the amounts shown. And yes, I passed on the walnuts. 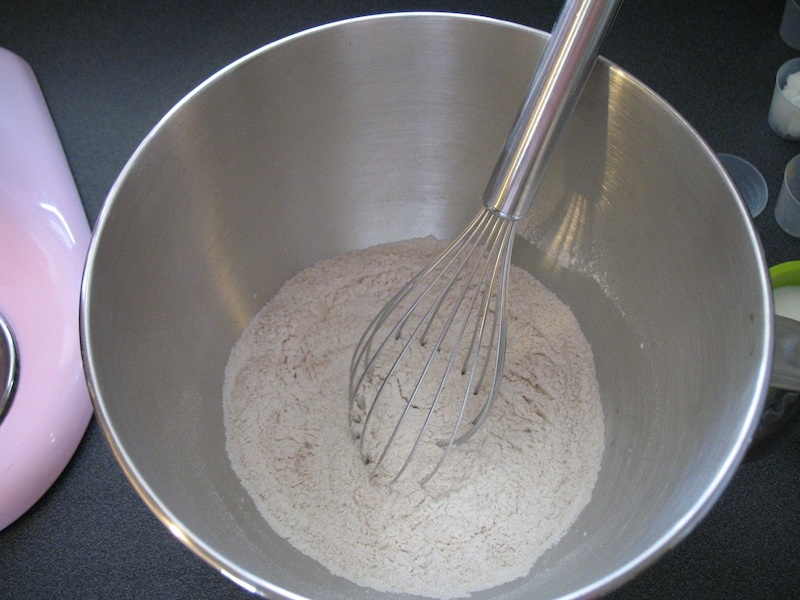 We then put the flour, salt, yeast and cinnamon in the mixer bowl and gave it a quick twirl with the whisk to blend. This “step” takes two seconds. Note: Because I’m using Kosher salt with a larger grain than normal table salt, I added it to the water to dissolve it. I first checked that the water was being added next (it was) so I wasn’t holding off the salt to some later step when it’s needed here. Had it been, I would have tossed the salt into the grinder to get it powdered and added it here. I suppose if I was really smart,I might pre-grind it anyway. 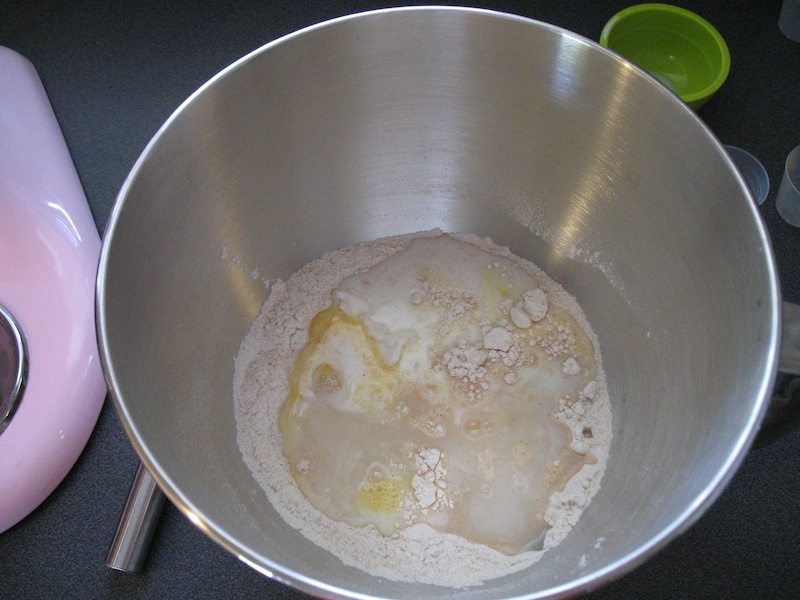 Now I add the egg, water, milk and shortening, all at room temp, and mix with the paddle at speed #1. 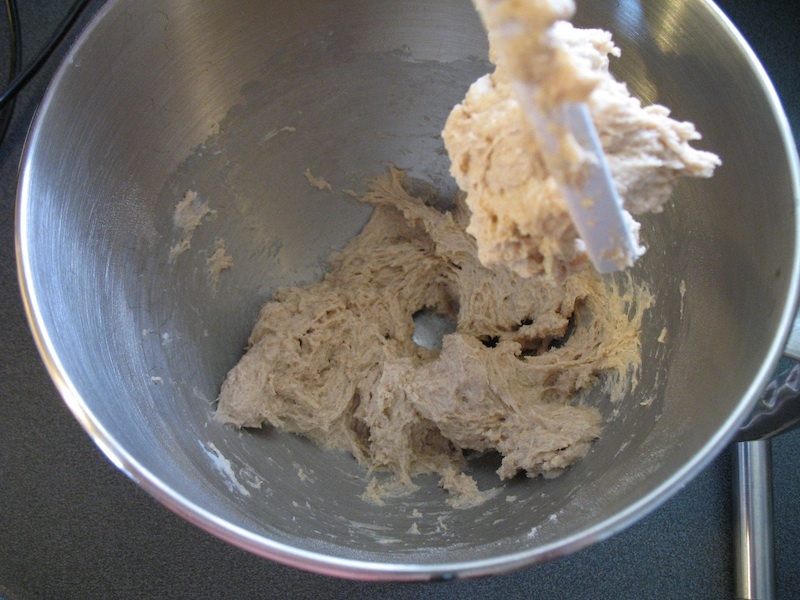 Center picture shows the dough beginning to develop gluten and the third shows the dough gathering into a ball. This took a minute or so before it gathered. 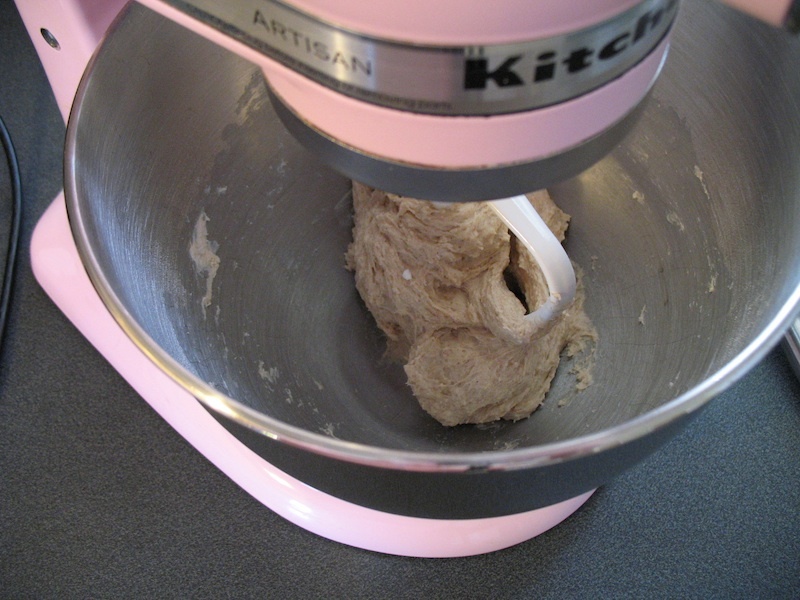 We then switch to the dough hook and knead at medium speed for 6 minutes. See that the bowl has pretty much cleaned itself right up. This dough is rather soft. 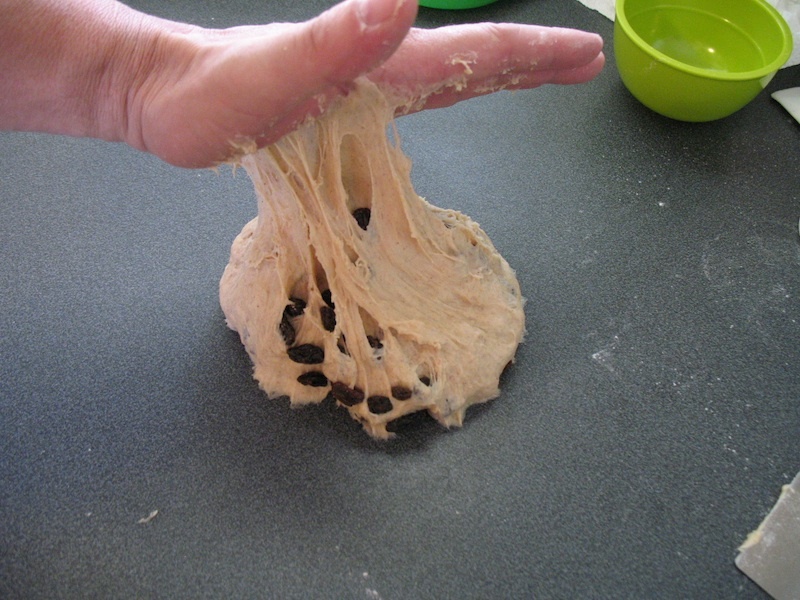 We now drop the kneaded dough on the counter and add the raisins to knead in by hand. 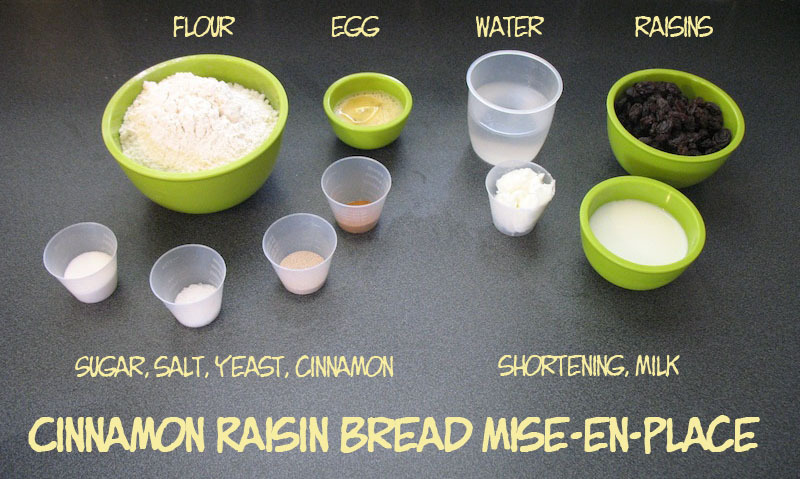 This may seem like a LOT of raisins, especially since there’s still more to add in the bowl but keep in mind that the dough will expand to about double before it’s time to bake so there’ll be plenty of bread between the raisins at the end. 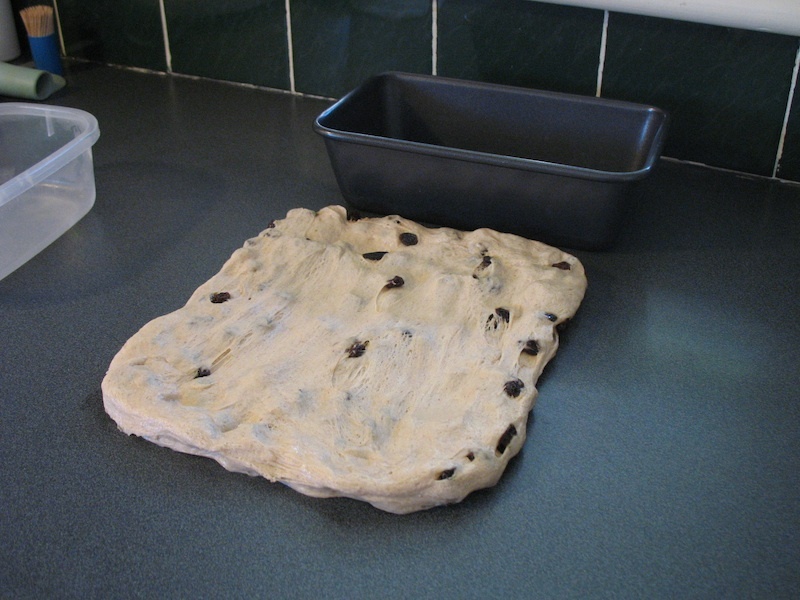 As I said, this dough was quite soft. The book says to add flour during the kneading (the step above) to adjust but I figured it would be better to do so later here so I’d know just how much flour it needed. 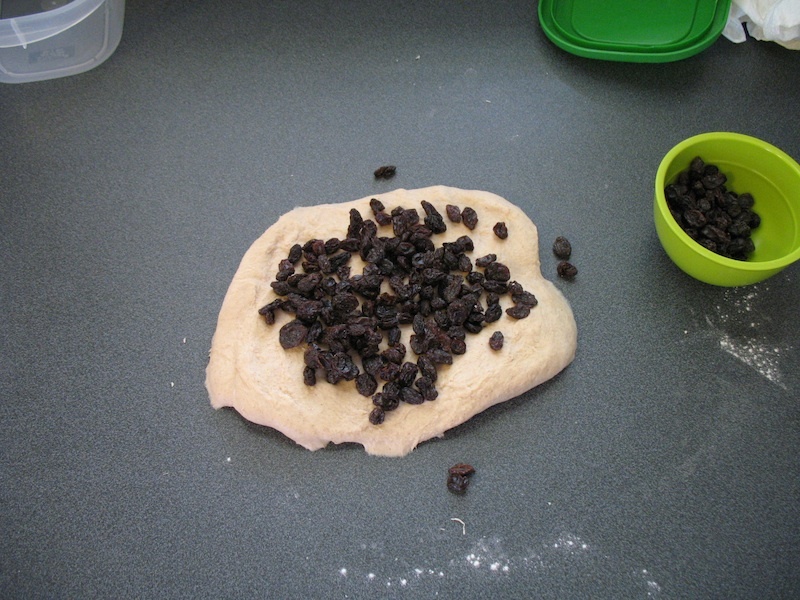 I kept sprinkling just a touch of flour as I was incorporating all the raisins so that the dough went from sticky (left) to just a little tacky (right). 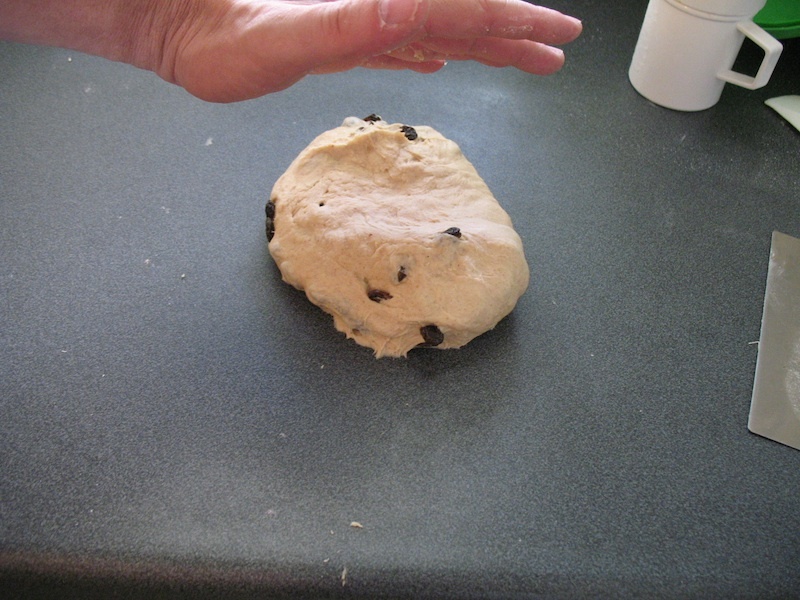 It was still a soft dough and had some “stick um” left to it but would release easily without gumming up my hand. Also not there isn’t an inch of flour sprinkled on the counter. 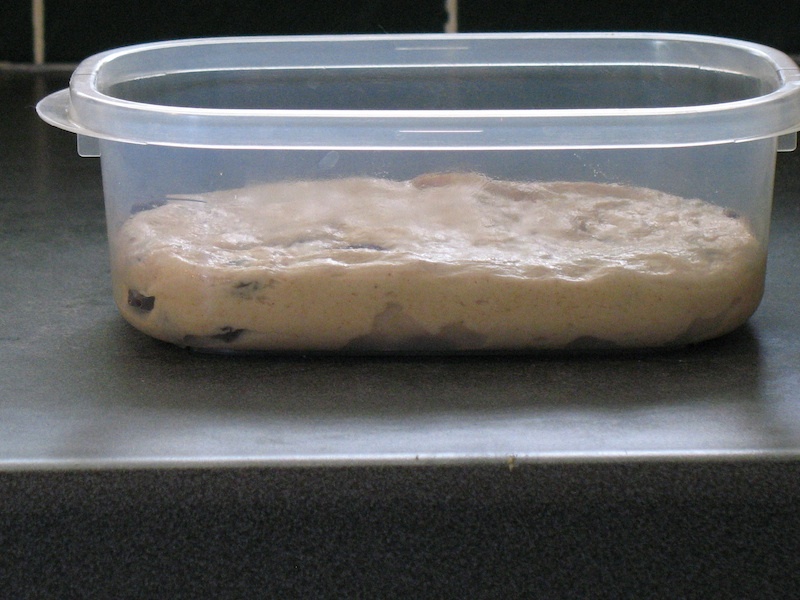 We do not want this to be dry dough. It’s about a 75% hydration dough. 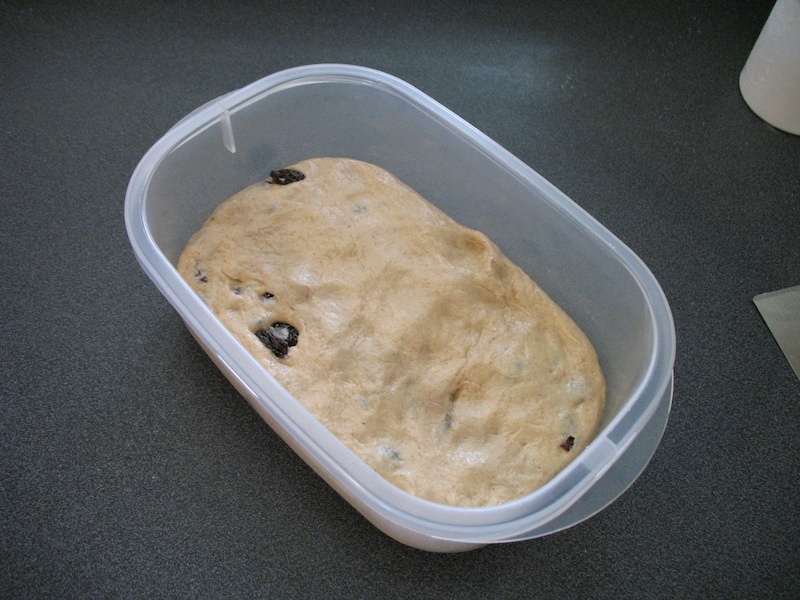 Once all the raisins are mixed in well,the dough goes into an oiled container and allowed to rise until doubled, about 2 hours. 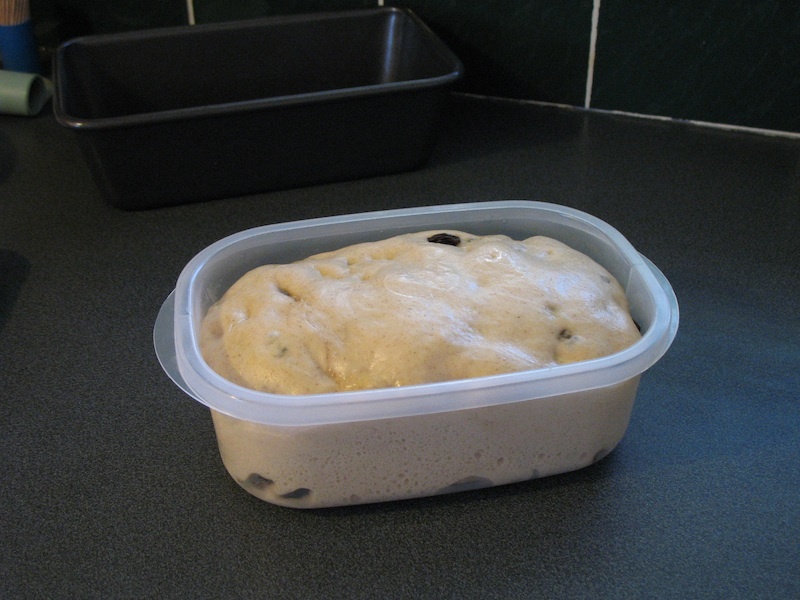 Except it’s really warm in the kitchen today and the dough MORE than doubled in about 80 minutes. This cause a bit of conflict with getting dinner ready, so I rather rushed the next step to get it rising again. 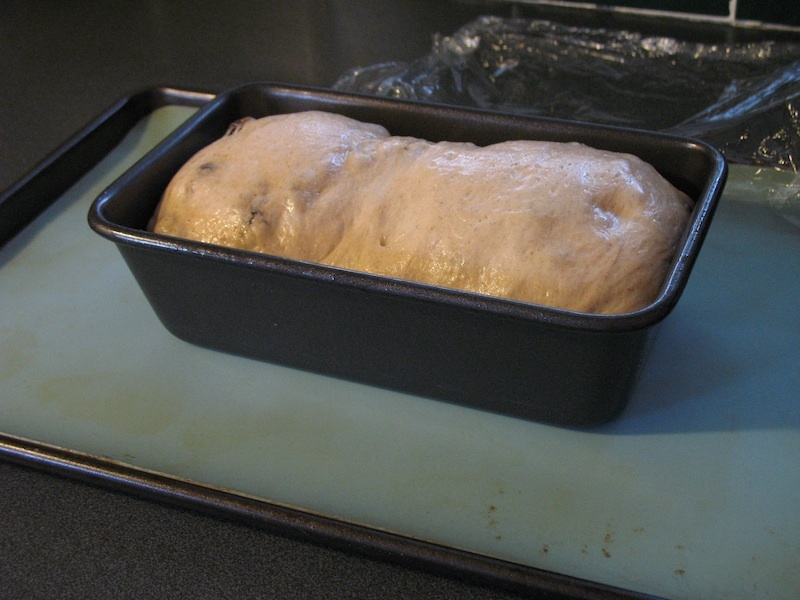 I spread out the somewhat over-risen dough and rolled it to fit the bread pan. 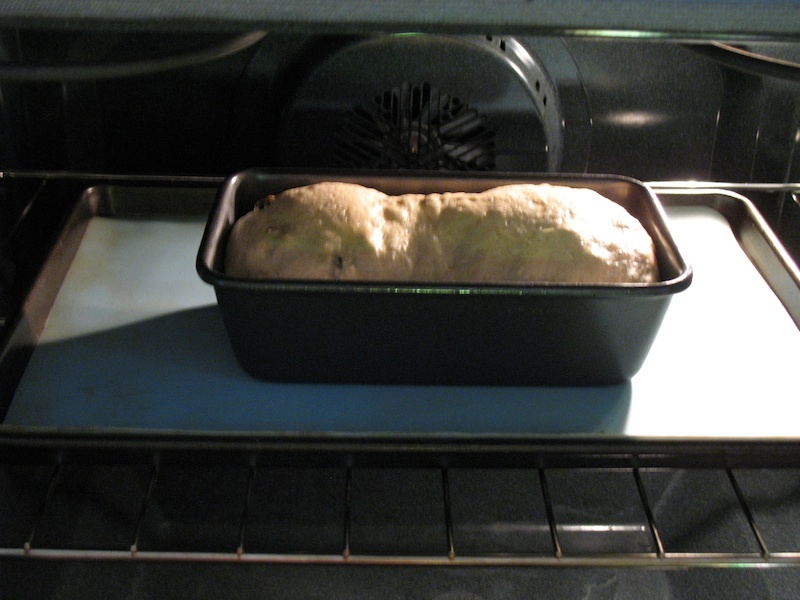 Unfortunately, I didn’t grab the right sized pan (it’s supposed to be 8.5 x 4.5 inch, this pan’s a 9 x 5 pan) so this caused the loaf to not be quite big enough to fill correctly. I didn’t notice this until too late. Oh well. 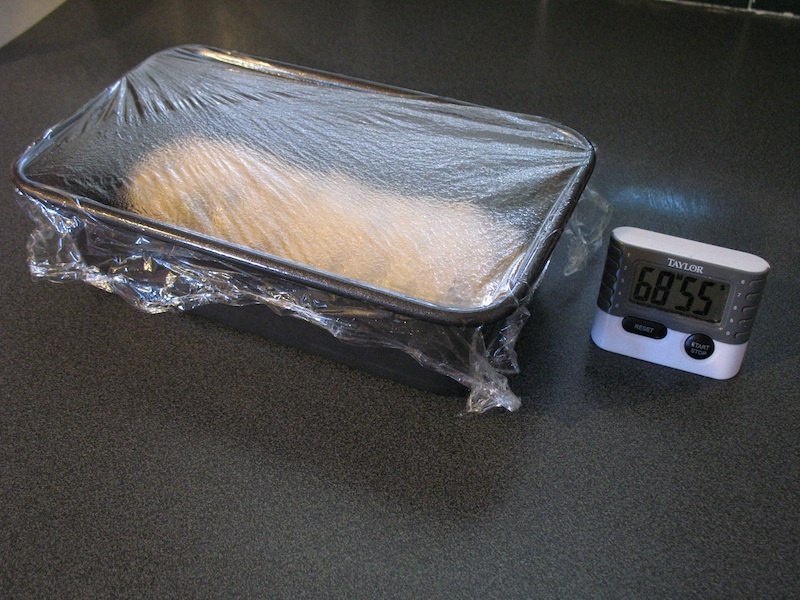 Shaped and in the pan, it’s left to almost double for 60 – 90 minutes. I set the timer to 70 minutes but actually ended up giving it just about 60 since it’s so warm in the kitchen. 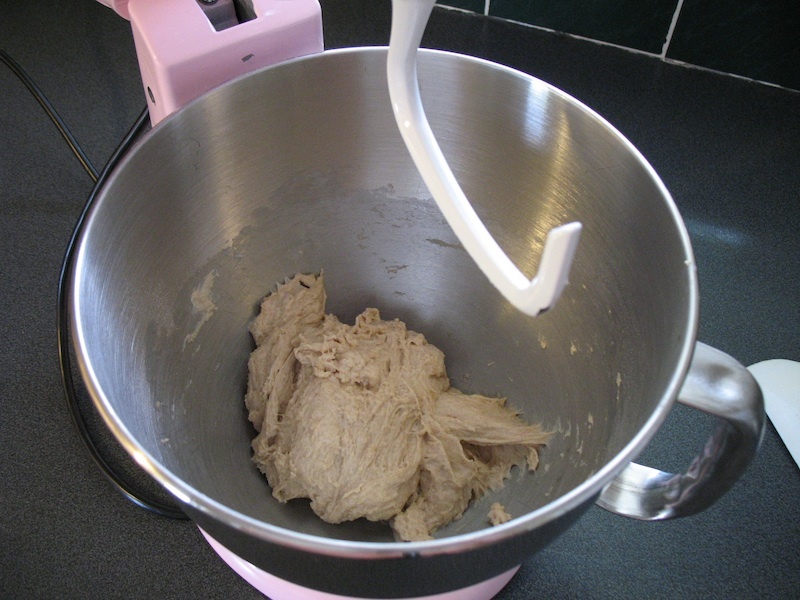 At the 60 minute mark, the dough’s just “peaking” above the edges of the pan. Again, because the pan’s too big, it didn’t quite fill the space up correctly so at this point the dough’s almost as big as it will get. You can also see how the ends of the loaf are a little higher than the middle, that because I was rushing the rolling process. 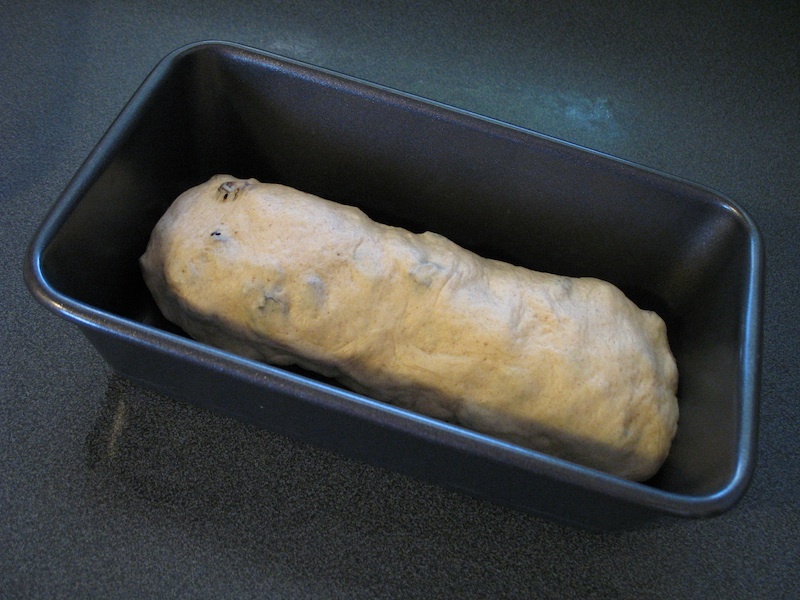 It’s still heading into the 350º oven anyway. The pan in on a tray with a silicone liner as I’ve been finding the black pans seem to get rather hot so the silicone acts as a bit of an insulator. The loaf is still great and tastes amazing. Sadly I don’t expect it will be around for long. This one, in spite of the relatively minor hitches, is a success, is delicious and is certainly marked as a “do it again!” The Bread Baker’s Apprentice loaf. 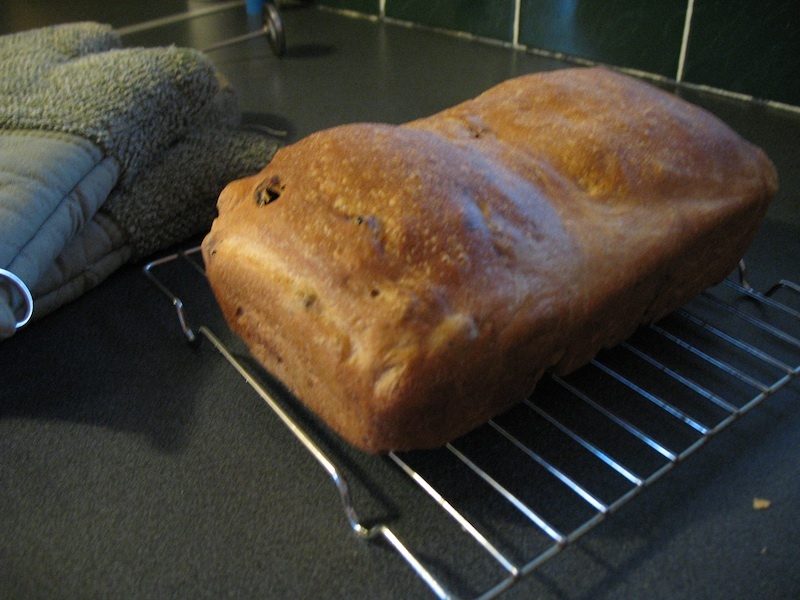 And another reminder that a great, tasty bread can really be very simple to make. This one hits all those spots. Next up in the challenge: Corn Bread! Great write up and photos. 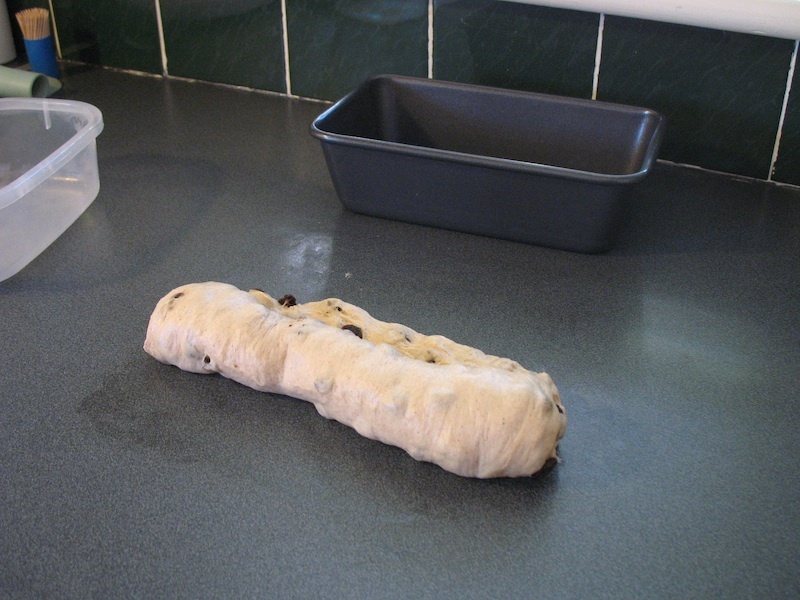 I loved this loaf too. I’m glad Peter has a sweet tooth. Great photos. Despite your loaf sizing issues, your bread turned out perfect. 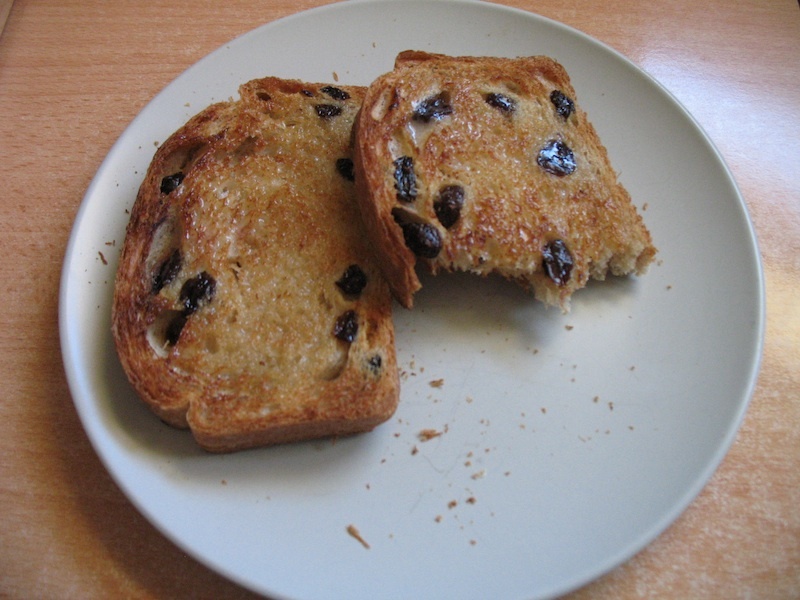 I could go for a piece toasted right about now!! Your bread looks great! 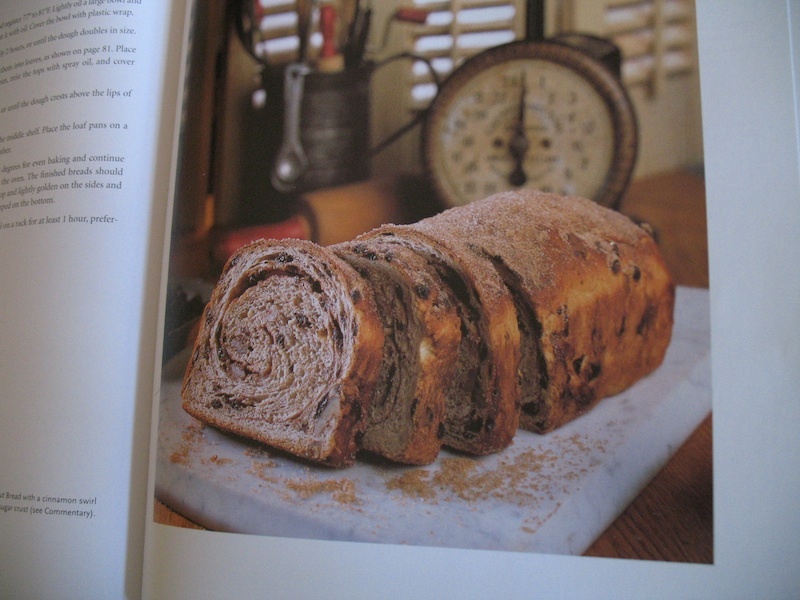 After having made it myself, I think it might be impossible to achieve the bread photographed in the book using the recipe in the book. Regardless, it is still very tasty. Gorgeous! I can’t wait to make it! I don’t have the right size pan either… but yours looks perfect to me. My loaves rose too fast in the pans (which were the right size) and they fell in the oven. Which meant they didn’t win any beauty contests. But like yours, they sure tasted good and disappeared in no time! Beautiful and thanks for all the pics. Mine did not rise really high, it’s dense but taste so good. This looks so delicious. I miss the baking and everything! Especially with some cinnamon bread! I am absolutely tempted to bake one today after this. I will have to substitute the flour for something that’s wheat free. 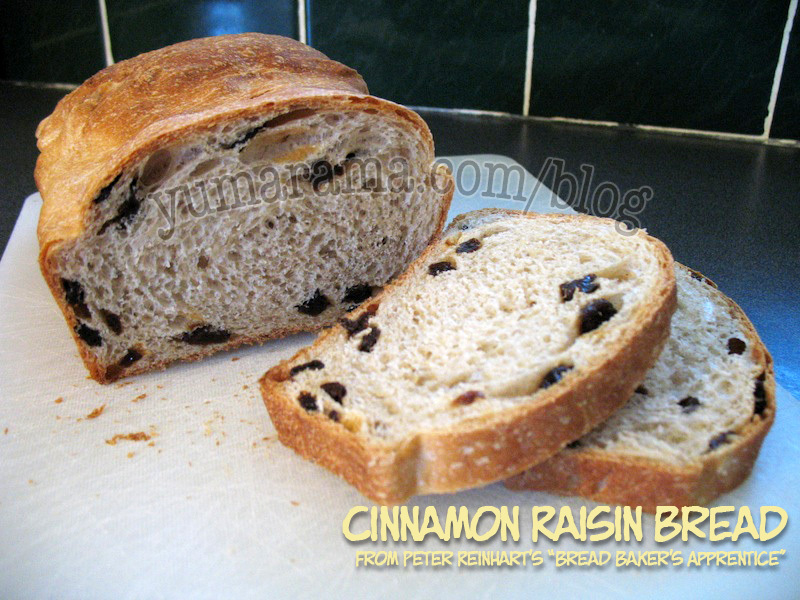 I love raisin breads and banana breads as well. can’t wait to munch on them later today! thanks for the recipe. Next PostNext Corn Bread: Breakfast in a slice.